A large-scale modernization of equipment is being carried out at Nikopol Production Association “Oscar”. The modernization purpose is to satisfy the customer’s quality requirements, while the consumers of the plant’s production are the enterprises of aerospace, nuclear, chemical and energy industries. 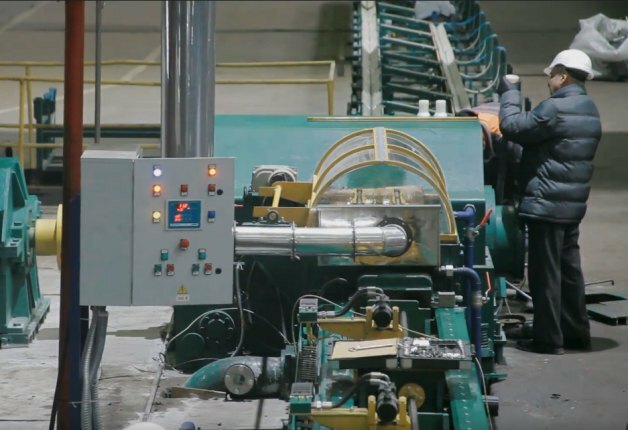 “High requirements for the precision of the dimensions and the quality of the surface of tubes, produced by our plant, require us to create new rolling methods and optimize the existing production processes,” Vadym Yermolaiev the co-founder of the “Oscar” Production Association said. By the end of 2018, as a result of significant investment in equipment modernization, hexad rotary loaders of almost all cold reduction tube mills have been replaced by epycyclic rotating feed-mechanisms, equipped with the systems for collection, preparation and supply of rolling liquid to the roll pass; the roll stands of the rolling mills of the 32nd group have been replaced by the roll stands of reduced weight and increased rigidity. Currently, commissioning works on the rolling mill KPW-25 are underway. This rolling mill has been configured in a continuous method of tube rolling by means of supply and turn of the workpiece using servoactuator. The rolling mill has acquired a new powerful work stand main drive motor; a new entering side and an exit side and a new lubricoolant system appeared; the technological capabilities of the rolling mill have been expanded, both in regard to the workpiece used and the size of the finished tubes. The work of all units and mechanisms of the rolling mill is fully automated. The rolling mill specific speed will increase its productivity at least by 1.5 times while maintaining proper quality of tubes. The next stage of reconstructing the existing technological processes starts in January 2019 with the pouring of concrete for a foundation for new rolling mills. These mills will be consistent with all current trends in rolling equipment: these will be a new generation of mills, with continuous operation. The first new generation mill is ready for shipment. Contract tests will take place in March, and this mill will be put into operation starting with April 2019. Serhii Naumenko the Executive Officer of the “Oscar” Production Association stated that the modernization of the rolling production will allow to reveal the potential of the “Oscar” Production Association, as well as to maintain the leading position in the tube industry under the conditions of constant, fierce competition at the market of precision cold-deformed stainless tubes, made of nickel and titanium alloys. “Thus, the rolling capacity of the Production Association “Oscar” will be almost doubled, which will allow to increase the output of tubes from 170 thousand meters to 200 thousand meters by spring, and to 300 thousand meters starting with May on a monthly basis. We will grow further, expanding our production on more and more markets” – Anatolii Khaietskyi, General Director of the Production Association “Oscar” stated.